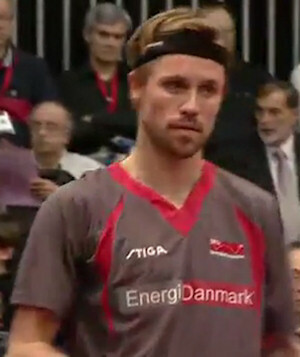 Michael Maze - Denmark's best professional table tennis player. Michael Maze broke into the World's top 10 for the first time in October 2009 following his stunning victory in the European Championships. In the final of the Men's Singles at the 2009 Liebherr European Championships, in front of a capacity crowd in the Porsche-Arena in Stuttgart, Germany, he defeated Austria's Werner Schlager to claim his first major title. 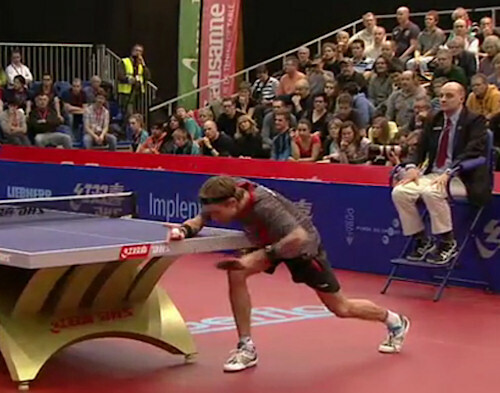 Michael Maze was born on 1st September 1981 in Fakse, Denmark, and started playing table tennis at his local table tennis club when he was just 7 years old. He then went to a table tennis club at Naestved, Denmark, where his talent was quickly spotted, and he was selected for the Danish National Team in 1997. When he was 16 years old, he moved to Dusseldorf in Germany to play professionally. Michael's first International success was in 1996, when, at the European Youth Championships (Cadet) in Czechoslovakia, he beat Russia's Fedor Kuzmin in the Boy's singles final, and also took the silver medal in the Boy's doubles final. After moving up from cadets to juniors, he then reached the final of the Boy's singles in the 1998 European Youth Championships (Juniors) in Italy, but lost out to Germany's Timo Boll. In the same tournament he also won a runners-up medal in the Boy's doubles, but it was in the following year, 1999 in Czechoslovakia, that Michael Maze took the Boy's singles and Boy's doubles titles to crown his junior career. Success in the senior ranks proved elusive for Michael, and it took until February 2004 before he finally won a senior singles title ... the prestigious invitational event, the European Top 12. It was held in Frankfurt, Germany and Maze beat Austrian Werner Schlager in the final to secure the title. Then, in Athens in August 2004, he won an Olympic Bronze medal in the Men's Doubles with fellow Dane, Finn Tugwell, beating the Russian pair, Dmitrij Mazunov and Alexei Smirnov. And then, to round off a successful year, in October 2004, Michael Maze also triumped in the Men's Singles final of the ITTF Pro-Tour event in his home country. Although Michael had been successful in his table tennis career ... winning a gold medal in the 2005 European Championship Team Event representing Denmark, and bronze medals in the Men's Singles of the 2005 World Championships, and 2007 European Championships ... it wasn't until 2009 that he made his big breakthough. It was at the 2009 European Championships, in front of a capacity crowd in Stuttgart, Germany, that he defeated Austrian Werner Schlager in the Men's Singles final to claim his first major title ... and achieve one of his goals, to be European Champion. "A dream has come true for me. I'm very proud and happy that I could keep my good condition and shape of the last few days. 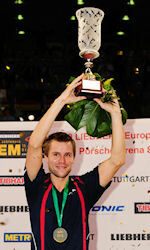 I beat Timo Boll twice (Team Event & Men's Singles) and now the former World Champion, Werner Schlager. In the past 15 to 18 months, I've improved my fitness significantly. This was decisive as I could finally move faster than Timo and therefore defeat him. I've also solved my long-term problem with my back. Timo is having a similar problem. As always, it was nice to play in Germany. There were lots of fans. Of course I don't have as many fans here as Timo, but the spectators were very fair. Of course they supported the German players a little more. My goal is to improve my performance constantly and to move even faster, and be fitter in order to continue to play at a world class level. The European Cup will be positioned in a place of honour in my apartment so that I can remember this great moment after losses that might come in the future." So, what equipment does champion Michael Maze use? 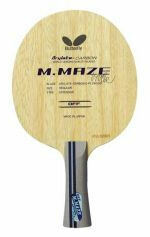 Michael Maze is sponsored by Butterfly table tennis and uses a Butterfly Michael Maze ALC offensive blade. He also uses Butterfly Sriver G3 rubbers. And how much training does Michael Maze do? Michael says he trains twice a day. "I get up and have breakfast and train for two hours. Then it's time for massage, lunch and a rest. In the afternoon I also train for two hours. I do match training, but also weight training to build up strength - especially before the big championships. It is important to train, but also not overdo it. You have to get a feeling for quality, when you train. It's the art of listening to your body without being lazy". So what's Michael's future goal? Michael, who speaks three languages (Danish, English & German), says his ultimate future goal is to be World Champion, Olympic Champion and/or European Champion. "Ever since I was a young boy and played table tennis at the youth centre, I have dreamed of this. So now it's ... one down, and two to go. Unfortunately, Michael was injured soon after his victory in the 2009 European Championships and hardly played any International table tennis between 2009 and 2012. However he was on the road to recovery in 2012 and started playing International table tennis again. At the 2012 Olympic Games in August he reached the quarter finals of the men's singles event, but by December 2012 he was still having problems. Michael then had hip surgery in December 2012 which meant that he was unable to compete and he missed the World Championships in May 2013. The only time that Michael competed internationally in 2013 was in October at the Liebherr European Championships in Schwechat, Austria. "In Schwechat I just went to make sure that I kept my place in the rankings, but I was afraid to move." Michael played competitively for the first time in 2014 in February at the DHS Europe Cup. The DHS Europe Cup is a new event and a qualifying event for the 2014 World Cup. 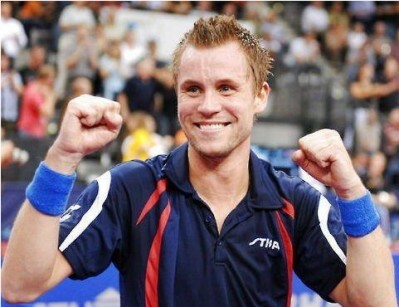 Michael reached the final, defeating world number 6, Dimitrij Ovtcharov, on the way. "It is so nice to play again. After 15 months finally I am back on track. I do not want to make any predictions, and I go one step at the time." Although he lost to Marcos Freitas of Portugal in the final in straight games 11-7, 11-6, 11-8, 11-7, Michael had little to regret. "I do not want to take anything from Marcos' win today. He was at the top of the game. I was tired and could not move fast and you need to be in top shape if you want to beat him. His game was mistakes free, and for me, there was not much left in the bag. I am satisfied with my performance but it will take time before I bring the stability in my game. I need more practice, more matches, more good and even more bad matches to come back and to be better then I was." Michael Maze has announced his retirement from international competition. Recurring injuries are the reason the 34 year old has been required to make this decision. I have made the most difficult decision of my career. 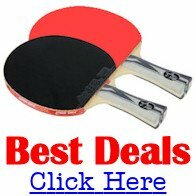 My time as a top table tennis player has come to an end. In consultation with my doctors and management we came to this very difficult decision. I had hoped to compete at this summer's Olympic Games in Rio but my body just can't take it anymore. After several operations I can no longer train one hundred per cent without pain and therefore not compete at the level I'm used to. I want to thank especially my family, friends and my sponsors Freklame A/S, ‪‎Butterfly and ‪NaturEnergi, as well as my fans from the bottom of my heart. I'm forever grateful for all the support given throughout my whole career. There are so many great experiences and memories to take with me from this amazing sport.‬‬‬‬‬‬"